A study in the current issue of the journal Herpetologica predicts the potential effects of climate change on four species of treefrogs found throughout much of South America. The main goal of the study was to determine which areas had suitable habitat for each frog species and predict where and how much of these areas are likely to be lost as a result of climate change. Herpetologica – Climate change seriously threatens the diversity of plant and animal life on Earth. It affects temperature and rainfall, forcing species to alter where and how they live and reproduce. Frogs, which need moist or wet conditions to breed, are particularly sensitive to such changes. If a species cannot adapt to a new climate, it might not survive. Habitat prediction studies aim to focus conservation efforts such that specific locations that are likely to become home to particular species in the future can be identified and protected today. Most studies that have attempted to predict the effects of a changing climate on South American plants and animals have found that ranges are likely to become smaller and move to the south and southeast. The four treefrog species in this study live in a range of habitats, from the equatorial Amazonian forest to southern pampas grasslands. In order to ascertain the potential extent of range shifts, the authors used six methods to model different ecological niches and climate change scenarios for 2050. The results showed that areas with a climate suitable for the four treefrog species in 2050 are dramatically smaller than those available today. Specifically, within 35 years, the treefrogs might be found in areas that are 14–52% smaller than their current geographical ranges. Additionally, climate changes in the models are expected to cause ranges to shrink, rather than shift, providing the treefrogs with a limited amount of new environment to inhabit. The current habitat diversity available for the treefrogs is also expected to decline. By 2050, researchers expect that the four species will be absent from the lowlands of the Pantanal floodplains and found almost exclusively within the Brazilian Atlantic forest. “The presumed disappearance of the four generalist treefrogs as a consequence of the climate change is therefore worrisome for the fate of other biological groups living in the Pantanal floodplain,” the authors wrote. The study concluded that the geographic range of all four species of frogs would decrease and primarily shift southward. Despite the considerable loss of suitable climates for these species, however, the treefrogs’ adaptability to a range of habitats provides an advantage over habitat specialists. Even in a global warming scenario, the frog species examined in this study are expected to maintain ranges that are broader than those of less adaptable species. Full text of the article “Potential Climate-Driven Impacts on the Distribution of Generalist Tree Frogs in South America,” Herpetologica, Vol. 72, No. 1, 2016, is now available. 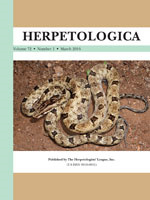 Herpetologica is a quarterly journal of The Herpetologists’ League, containing original research articles on the biology of amphibians and reptiles. The journal serves herpetologists, biologists, ecologists, conservationists, researchers, and others interested in furthering knowledge of the biology of amphibians and reptiles. To learn more about the society, please visit http://www.herpetologistsleague.org.